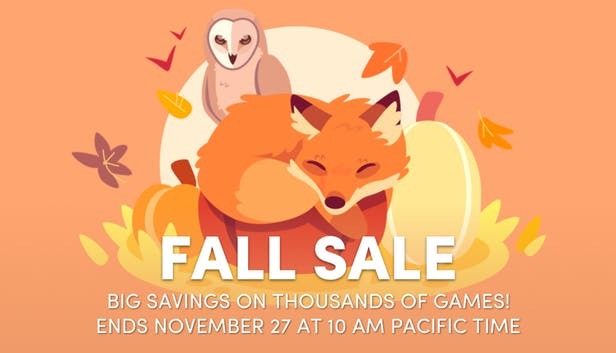 We are participating in the Humble Store Fall Sale. Ends November 27 at 10 AM pacific time. Long time no see. I am Lee Yunseok, creator of YGGDRASIL STUDIO. We are participating in the Humble Store Fall Sale now with 66% off to our TEEN version. The sale ends November 27 at 10 AM pacific time. For our next step, we need to let you know about these sales promotion activities. In these days, we are preparing playable DLCs that available in the original version. In the Fimbulvetr, one of it, we will talk about some things that have not been revealed in the Discouraged Workers. It will be a Kinetic Novel consisting of NVL-mode and sketch-art. We will first release it in Korean, my first language, and then anyone will be able to translate through GitHub. Of course I also have plans to support major supported languages. Fimbulvetr will also be released as a standalone application that works on mobile and tablet device. That's all I can say today. Then, I'll be back soon.